Rebecca Montsion is a PhD student with Metal Earth. 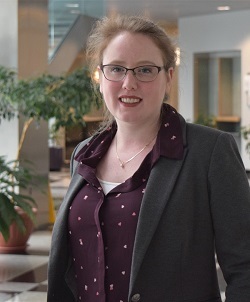 During her Master's she collaborated with a team, called Logan's Legends, of early career professionals at the Geological Survey of Canada on a project for the Frank Arnott Award Challenge (http://faa.dmec.ca/Home.aspx). Their work demonstrated a method of multi-disciplinary exploration techniques and mineral prospectivity mapping, which located prospective zones for Cu-porphyry exploration in an area covered by glacial till in the Quesnel Terrane of Brish Columbia, Canada. This method is anticipated to provide the exploration community with a tool that is accessible to a wide audience of geoscientists and highlight areas that would benefit from additional exploration. In October 2017, at the Exploration 17 conference in Toronto, Canada, Logan's Legends won first place in the experienced category of this international geoscientific competition. Following this achievement, Logan's Legends will be presenting a half-day short course "Holistic exploration in covered terranes: An example applied to the Cu-Mo porphyry prospectivity of Quesnel, eastern British Columbia" at the 2019 PDAC convention in Toronto Canada on March 6. They are offering this course to benefit any geoscientist who wishes to learn about integrated exploration techniques and mineral prospectivity modelling, in the hopes of adding to the global exploration discussion and increase interest in greenfields and challenging exploration settings.